Before allowing your new kitten or cat outside, ensure it has a means of identification, either a securely fitted safety collar with a tag (showing your telephone number) or, ideally, a microchip identification implanted under the chin on the scruff of the neck. Prior to any trips outside it is worth considering how you intend to give your cat or kitten access outdoors in the long-term. If you are at home for large periods of the day you may wish to consider allowing access ‘on demand’ via the back door or a conveniently positioned window, for example. However if you are out at work during the day you may prefer to install a cat flap (see how to choose and use a cat flap). The local environment will dictate what rules you put in place regarding any time limits on access outside. You may wish to confine your kitten or cat at twilight, so that it can remain indoors at night, or limit its access outside at times when traffic may be busy locally. Because of potential infection with diseases such as enteritis or cat flu, your kitten should not be allowed outside until at least a week after it has finished its first course of vaccinations at about 13-14 weeks old (depending on the vaccine). You could then let it explore outside if it is supervised. Once it is fully vaccinated and has become used to life in your house, you can start to let your kitten go outside a bit more. However before you allow your kitten free access outdoors, make sure it has been neutered (at around 4 months). 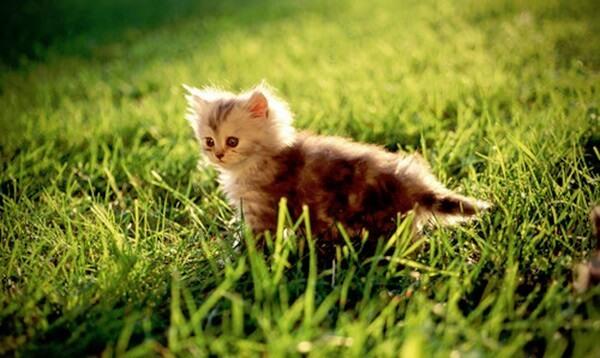 You should also ensure your garden is safe for your kitten first by covering any ponds, blocking up any holes in the fencing and removing any potentially hazardous garden substances or objects, such as wood preservatives, insecticides, sharp implements etc. It’s useful to get your kitten or cat used to being called to come to you – you can do this by offering it little treats so that it’s happy to respond. You then have a little bit of control when you go outside to call them in. Choose a dry day (if possible) and a quiet time when you can accompany your kitten outside, allowing it to explore the new environment. Excitements, such as other cats, dogs which might bark or children screaming in the neighbour’s garden, are best avoided for the first couple of excursions, so that your kitten (or cat) can concentrate on you and isn’t spooked. Continue to accompany your kitten until it is used to your garden and can find its way back to the house without difficulty. It is best not to leave your kitten outside alone until it is 6 months old and it is essential that it is neutered (from 4 months of age) before allowing it unsupervised access. If you have adopted an adult cat you probably will have been advised to keep it in for 2-3 weeks to settle into its new home. Some cats will tolerate this period well yet others will look to go outside sooner rather than later. It is probably best to stick to this timescale, particularly if you feel there have been any signs of anxiety since its arrival. When you first decide to allow your cat outside, choose a quiet, dry period when you are at home all day and do so a short while before a routine mealtime. Accompany your cat outside but don’t be alarmed if it disappears into some shrubbery; this is a normal strategy to enable it to get acclimatised to its new environment in a place where it can observe without being seen. Leave the back door open initially and, after 30-60 minutes, call your cat indoors for its meal and then repeat the following day. Most cats adapt extremely quickly to exploring their new territory outside and they probably will not need a gradual introduction of this kind but the more timid individuals may benefit from gradually increasing periods outside in the first few weeks. Some people take on adult cats that have never been outside before and wonder if they’ll be able to adapt to going out into the big wide world. But it’s amazing how adaptable cats are, and there are many examples of cats that have led an indoor existence for most of their lives relishing the opportunity to go outside in a new environment. They may be a little nervous at first, but most take to it like a duck to water. Some even do some hunting and it’s fascinating to think that all of this instinctive behaviour has lain dormant yet can still spring to life when the cat gets the opportunity to do what comes naturally!